That’s a bar, I told my seatmate as we jumped off our boat, splashing into the shallow translucent waters of Sangat Island. What do you mean a bar? That’s no sandbar came his quick reply. We were wading onto shore, our cameras held high above the warm water. Not a sandbar dummy, a proper bar! 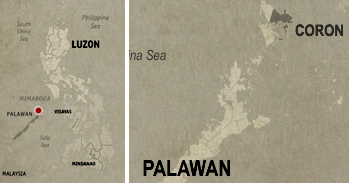 You know where you drink San Miguel and Red Horse beers from. 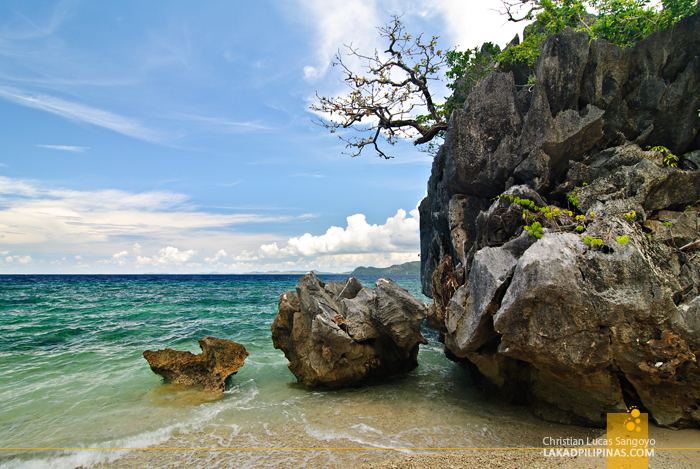 We finally came ashore and stared some more at Sangat Island Dive Resort’s rustic bar. It sat snugly on a coral rock with its thatched roof some meters away from us. It is the most beautiful bar I want to drink my Red Horse from, Below Zero or not. But we really didn’t come here to drink beer. Just before we do the Coron island hopping tour, the group decided to have lunch at Sangat Island first. And yes, we’d also be checking the accommodations being offered by one of the most popular dive resorts in the island too. You can repeat after me; The PHILTOA peeps have a thing for checking rooms. LOL. Lunch was uneventful. After the group razed the packed meal we brought along; rice, roasted pork belly, fish fillets and what nots, we immediately started our tour of the island. Sangat Island Dive Resort sits on the southwestern side of Sangat Island. 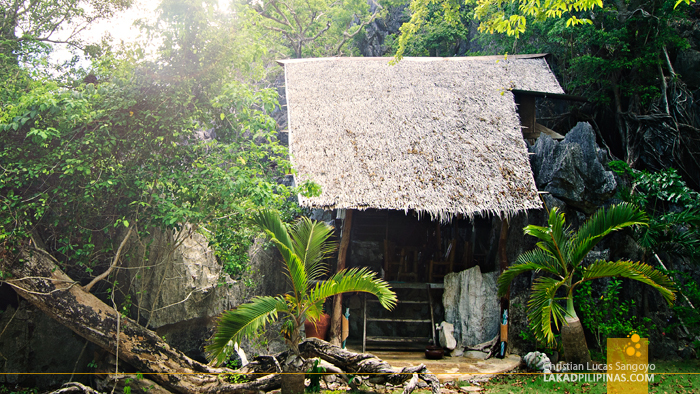 It opened in 1994 and has thirteen unique cottages available for guests scattered throughout the area; near the beach, on hillsides, on top of the hill and a special one, dubbed the Robinson Crusoe Cottage, located on an isolated beach off the southwestern coast of the island. While we weren’t able to check that hut out, we were able to visit the next best thing; their Lambingan Villa. 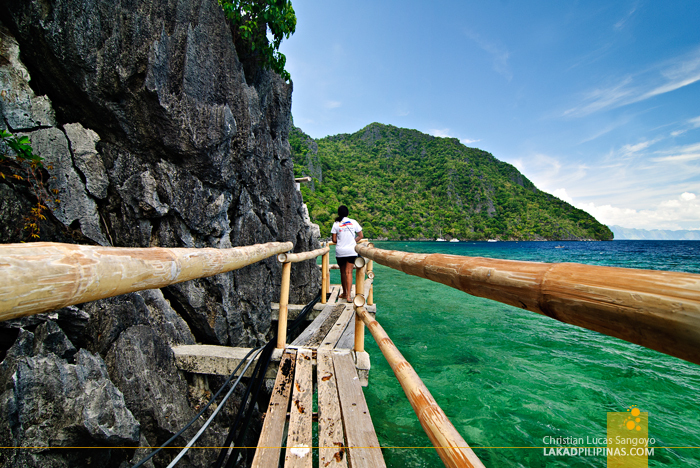 To get there, one has to traverse a creaky, hanging wooden bridge hugging one of the island’s limestone cliffs. It’s a three-minute walk that would take more than three minutes. Like us, you would no doubt, be stopping so often to take photos and appreciate the tropical scenery that it would likely take you more than ten minutes to reach the villa. The rickety pathway opens to a lovely stretch of white sand beach hugged on all sides by dark limestone cliffs clinging with lush vegetation. 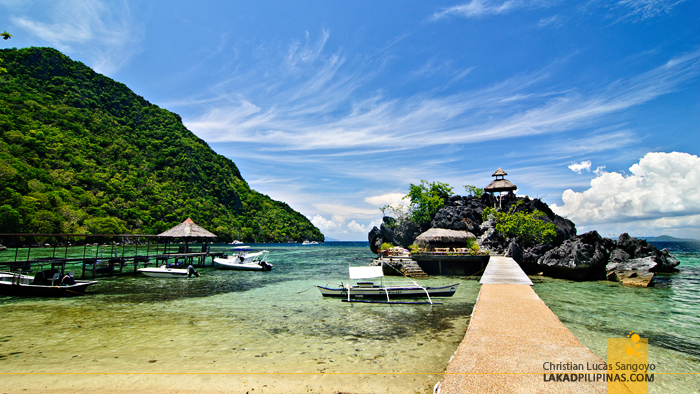 Welcome to Lambingan Villa’s own private cove where the word lovely is an understatement. 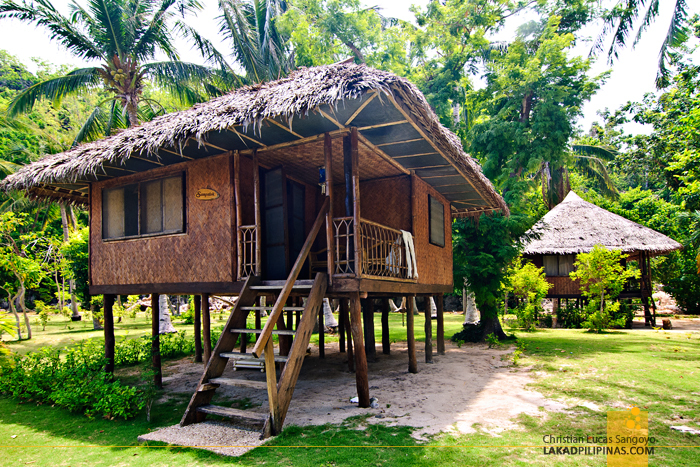 The cottages at Sangat Island Dive Resort are made in the tradition of the Filipino bahay kubos; cogon roofs, bamboo floors, sawali walls, natural wood post and beams. There’s no air-conditioning but who needs them when you’re on a hut, a fan would do. Worry not though; modern toilet and baths are available on every cottage. Nothing compares to the bath area of Lambingan Villa though. 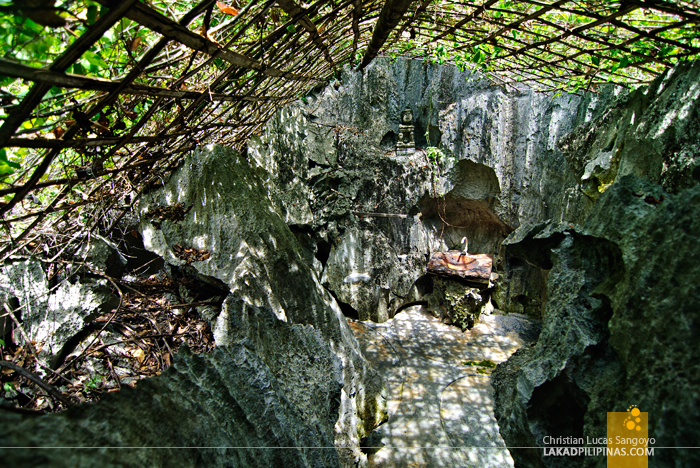 Located on a natural rock clearing beside the hut, it is surrounded by uncut limestone walls and a roof made from natural vegetation. The cove is very private that no doors are needed, only the local wooden idol sitting atop a rock would be seeing you as you take your shower. 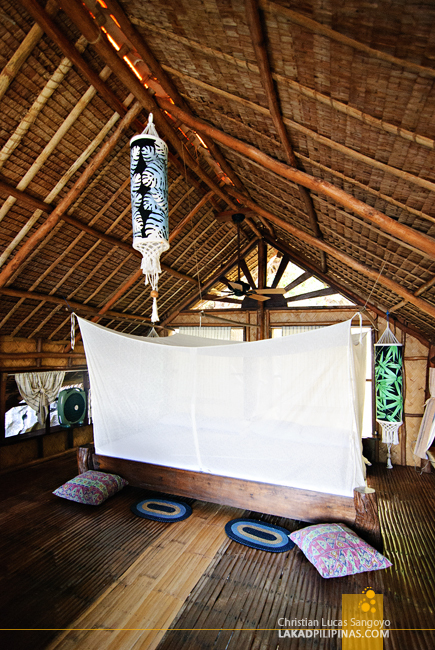 Sangat Island Dive Resort’s Lambingan Villa is a three-storey hut with a hammock lounge on the ground floor, two queen-sized bed on the second floor and a king bed on the third. It can accommodate six adults and four kids; rates dance anywhere from $128.00 to $183.00 per person per night, depending on the season. A bit hefty yes, but like all cottages in the resort, the rates are inclusive of three buffet meals everyday, complimentary coffee or tea and roundtrip transfers from the airport. But forget about the rooms. 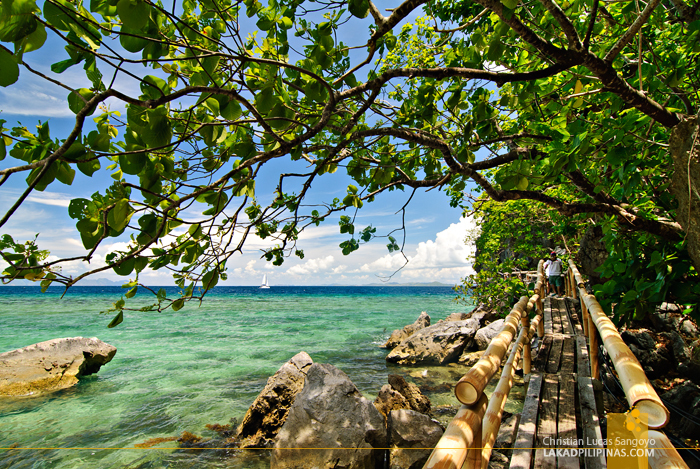 The thing that really make Sangat Island Dive Resort tick is below its waters. 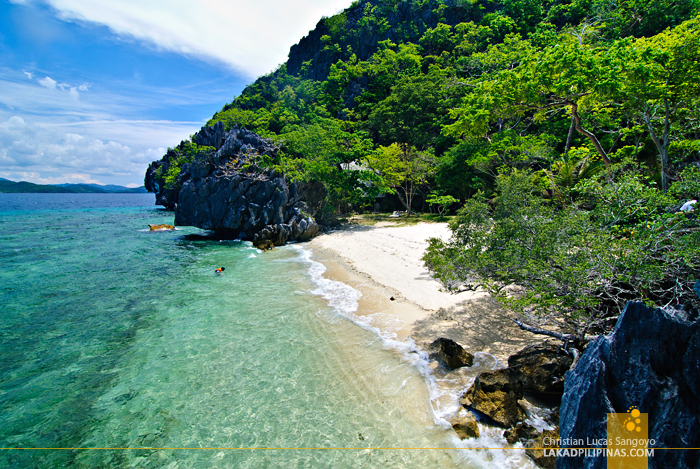 With a very rich marine life and eleven sunken World War II ships just a few minutes from its shores, you really don’t have to wonder why it is the resort of choice for divers visiting Coron.